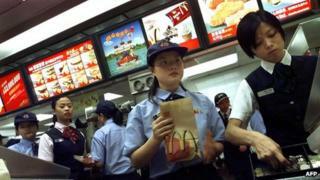 Fast food chain McDonald's has suspended sale of chicken nuggets and some other products in Hong Kong. It said it had imported chicken and pork from Shanghai Husi Food, the Chinese firm that allegedly supplied out of date meat to fast food firms. China has suspended operations of Shanghai Husi after local media reports claimed it re-processed expired meat. McDonald's had removed nuggets from its menus at its Japanese outlets earlier this week over the same issue. It said on Wednesday that about 20% of its chicken nuggets sold in Japan came from Shanghai Husi. McDonald's said that nearly 500 stores in Japan had removed chicken nuggets from their menu, adding that sales were expected to resume after it switches to other suppliers in China and Thailand. McDonald's has also stopped selling its McSpicy chicken filets, chicken and green salads, fresh corn cups and iced lemon tea at its outlets in Hong Kong. The move came after Hong Kong's food safety regulator suspended all imports from Shanghai Husi Food. The regulator added that any food products from Husi already imported into Hong Kong would be marked, sealed and banned from sale, pending the results of the ongoing investigation by Chinese authorities. Meanwhile, the Reuters news agency quoted McDonald's as saying that it had imported certain products from Shanghai Husi between July last year to June this year, but no food items from the Shanghai supplier remained in stock. "We reiterate that until today, all the food sold at McDonald's restaurants conforms to the food safety standard under Hong Kong legal regulations," the firm said. Its other customers in China include Yum Brand owned KFC, coffee chain Starbucks and Burger King. Japanese convenience store operator, FamilyMart, has also admitted that its "Garlic Nugget" imported from the Shanghai firm was sold at nearly all of its 10,000 outlets across Japan.